A few weeks ago, I shared my daughter’s second birthday party. At two, she is just starting to understand how wonderful birthdays make us feel. So naturally, I did everything I could to make it unbelievably special for her. As I cut, pasted, and crafted my way through her birthday-party details, I wasn’t oblivious to the fact that there are many kids who won’t be celebrating birthdays this year. Their parents won’t have a home to gather their loved ones together in, and they won’t have the money to buy a cake or presents. They won’t be able to host a party, let alone think of a “theme” because they’re homeless. Then there are children who find themselves sick and in hospitals on their birthday. Imagine what that feels like? Poked and prodded, weak and confined? As a mother, I literally couldn’t imagine either situation, because all I am blessed to know is my daughter’s smile above the glow of her birthday candles. I’m working hard to teach my daughter the importance of giving back, even at times where moments are seemingly all about her. Giving back during birthday parties and thinking about kids who are less fortunate than my daughter in her own moments of celebration is a perfect example. On that note, I’ve had the privilege of meeting two amazing moms who are actively making a difference to bring joy back into birthdays for homeless and sick children. Paige Chenault’s The Birthday Party Project hosts monthly birthday parties at homeless and transitional living facilities…and Stephanie Grimm’s The Confetti Foundation supplies birthday party kits to children who spend their birthdays in the hospital. I had a great time chatting with Paige and Stephanie. Not only did they both begin their charities after becoming mothers, but both women also incorporate their children and their kids’ friends into their work. And both believe our kids can make a magical difference in the life of a child who loves the same songs, shows, and toys as they do…and should also feel the same birthday joy. They shared with me some brilliant, actionable ideas and advice for ways kids can give back, even at their own birthday parties. 1. Volunteer at a birthday party for a homeless child. Kids five and older can help volunteer at a party and learn the benefits of helping others. 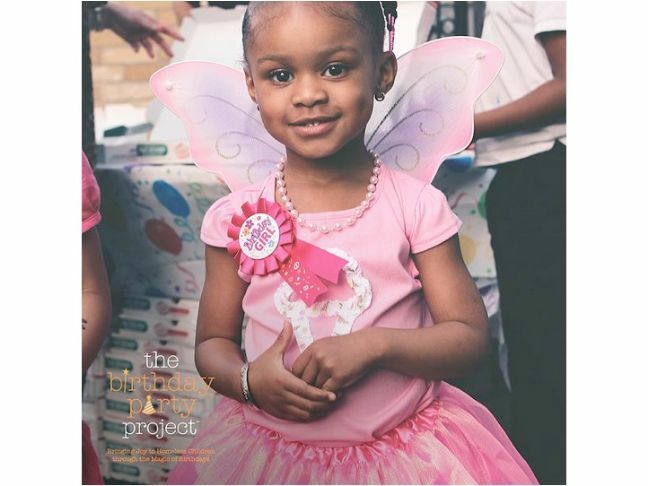 The Birthday Party Project now celebrates with nineteen agencies in five cities across the country, with over 750 kids in attendance every month. And they’re growing very quickly, so check their site to see if there’s an outpost near you. Consider making it a tradition to volunteer at a party every year during the month of your kiddo’s birthday. Organizations like The Birthday Party Project also accept duplicate birthday party gifts for their party recipients. (So keep that in mind when you four year old gets about ten minions too many at his Despicable Me party.) Toys valued around $30 can be sent to The Birthday Party Project distribution center to help brighten a homeless child’s birthday. 3. Get crafty for a cause. At your child’s next birthday party, why not set up a craft station of blank cards, markers, and stickers, and let the kids go to town creating birthday wishes? The kids will get excited to know that they’re doing something special for another kid in need of a little bit of sunshine. Learn more here. 4. Put extra party supplies to good use. All those extra party tchotchkes you stocked up on and never used? Don’t let them go to waste (or collect dust in storage)! Moms can turn party extras into what Chenault calls “birthday magic.” Just send any of the below extras to The Birthday Project. 5. Raise money to buy a birthday gift for a child in need. Even if you and your children do not have a Birthday Party Project coordinator in your area, your family can give back on a national scale. 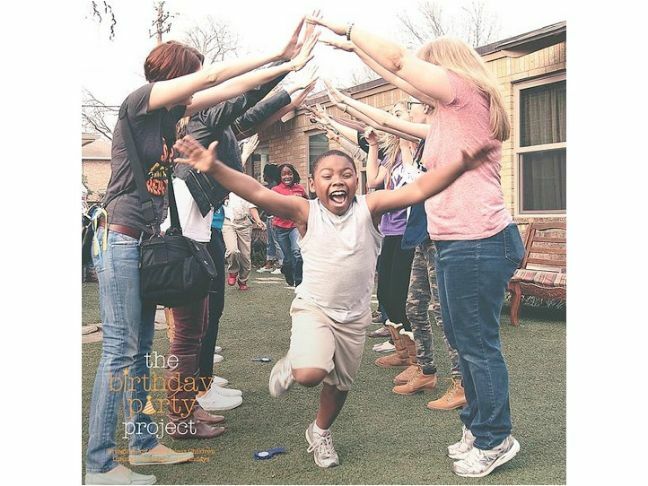 The Birthday Party Project believes in creative donations that help our kids understand the importance of giving back. Around their birthday, they can make a donation from their piggy bank, host a lemonade stand, or even contribute via their unique #shareyourbirthday initiative. 6. Learn through Mom’s example. The best way for my daughter to understand the importance of giving back is for her to see me making charity a part of my life. The Confetti Foundation seeks volunteers nationwide to approach local hospitals to explain the project and hopefully get them on board. These volunteers are lovingly known as “birthday fairies” and “birthday heroes.” Once you, as a birthday fairy, establish a partnership with your local hospital, The Confetti Foundation sends party kits to to you, and in turn, you’ll deliver them to the hospitals’ Child Life Services departments. 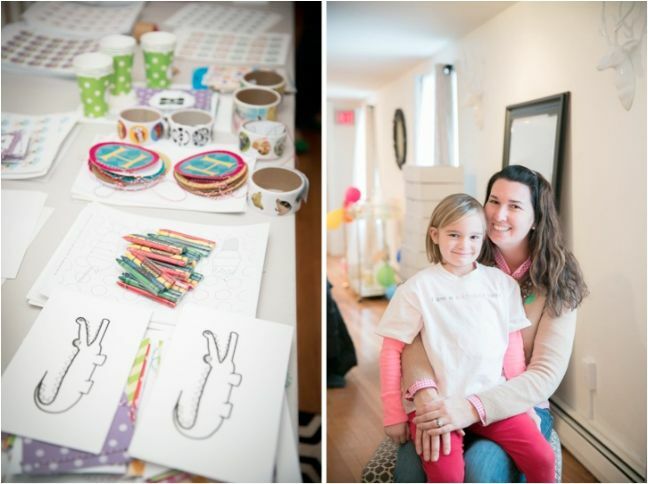 The kits provide a variety of party supplies and decorations for four people—enough for the child and the three visitors allowed in the room at the same time. “All families have to do is add cake,” said Grimm. 7. Fuel a wish list. 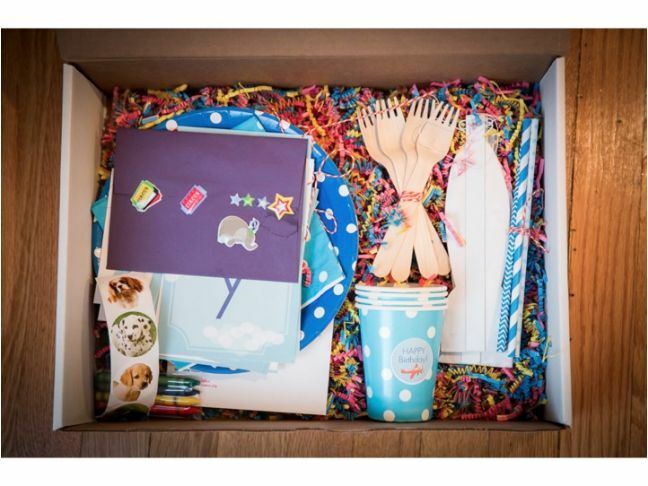 If your little one loves crafts, consider putting together a birthday care package for the The Confetti Foundation so they can have all the products they need in their birthday care boxes. You and your child can find these together in your local crafts store, then decorate your package, en route to The Confetti Foundation—find their address here. 8. Build a giving spirit with baby steps. Let’s be honest: it might be hard for kids to think about not getting any presents—especially if they are used to diving into mounds of wrapped gifts from party guests. You can help ease them into the giving spirit with Kids Can Give Too. The website lets you send out party invitations and thank you notes, but invites guests to donate money instead of bringing presents—with half the money going to the birthday kid and the other half going to the child’s choice of the site’s charitable partners like the Water.org, Ronald McDonald House, Autism Speaks, and others. Guests get to save time shopping for a present, and the birthday star gets to both enjoy the feeling of helping others and receive a little something too. 9. Support a furry friend. Is your birthday girl an animal lover? Raise awareness and support for some adorable furry friends by hosting a birthday party geared toward supporting your local animal shelter. Have guests bring pet food, toys, old blankets (which many animal shelters need), or other wish list items the shelter has. Some animal shelters or humane societies will even host birthday parties at the shelter, letting kids pet and play with the animals looking to be adopted. 10. Throw a birthday party for a book lover. Did your child devour Dr. Seuss? Lose track of time paging through Harry Potter? Celebrate his love of reading by having a book-themed birthday party that helps to spread the love of reading to others, too. Instead of presents, ask guests to bring new or gently used books to donate to a local children’s hospital, homeless shelter, or classroom in need. Some locations like children’s hospitals may allow party guests to come read books to other kids before handing them out or donating them to the organization. 11. 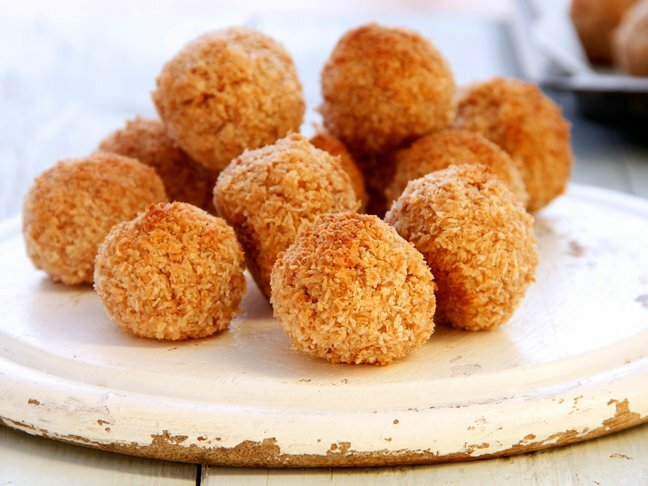 Enjoy good eats to end hunger. The best part of any birthday party? The food, of course! Support Share Our Strength’s No Hungry Kid campaign by hosting a birthday that focuses on food—and remembers those that go without. Have party guests build their own ice cream sundaes or top a pizza, and give a donation to No Kid Hungry instead of bringing a gift. Another option: Host a bake sale and get the kids involved in measuring and mixing ingredients to make different kinds of breads, or have fun decorating cookies or mini cakes to sell to raise money to help kids who often go hungry. 12. Celebrate with a soldier. Want to support a soldier with your birthday celebration? Adopt a US Soldier offers both ongoing and one-time support programs that let you send a care package to a soldier serving overseas. Use your birthday celebration to make cards and pictures of support, and ask guests to bring wish list items from a suggested list of treats, toys, and toiletries needed most by those serving our country. Be sure to check lists like this to see what is needed most and which items you aren’t allowed to send. 13. Give a gift bag that really makes a difference. Instead of handing out party bags, spend part of your party creating a very special bag for someone else. My Stuff Bags Foundation works with children who get removed from unsafe homes by providing them with a duffle bag full of comforting items as well as basic necessities often not provided by government agencies. From clothes and toys to books, toiletries, and a special blanket, the items in these bags can help ease a child’s transition from an unsafe home to an unfamiliar shelter or foster home. Ask party-goers to bring items for the duffle bag or spend the party making easy “no-sew” blankets (they have directions on their website) to create a soft, colorful security blanket for a child in transition. 14. Celebrate a favorite food and help a local food bank. Is your child a peanut butter fanatic? A pasta lover? A fan of canned fruit? Help out a local food bank by asking party guests to bring jars, cans, or boxes of the birthday girl’s favorite non-perishable food to donate to those in need. Set a goal of donating twenty-five jars of peanut butter or 100 packages of pasta, and choose a fun way to display the donations as they come in like a can pyramid or pasta log cabin–style house. Depending on the age of the child, some food banks may let you host an event at the food bank, packing the food donations into bags for families in the area. You can still teach your child about charity while having a traditional birthday party. After the party is over, celebrate your child’s new age with a matching number-related toy giveaway. Help your birthday boy think of others by having him give away the same number of toys as the age he is becoming. Turning five? Help him find five books or toys—old or new—that he’s willing to part with for a less fortunate child. You’ll end up with less clutter, and he’ll end up with an important lesson about helping others. Paige Chenault, an event planner and mom, developed The Birthday Party Project after the birth of her daughter, Lizzie. She always loved planning meaningful events, but when she became a mom, she decided that celebrating others was her purpose in life. 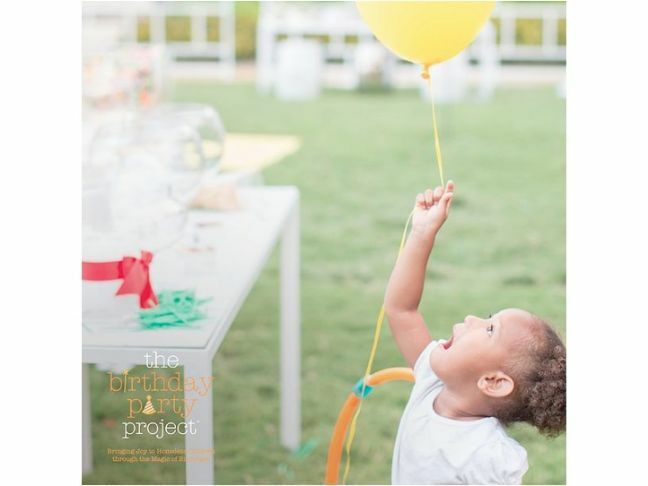 After years of research and consideration, in 2012 Paige embarked on a new journey, and The Birthday Party Project was born. 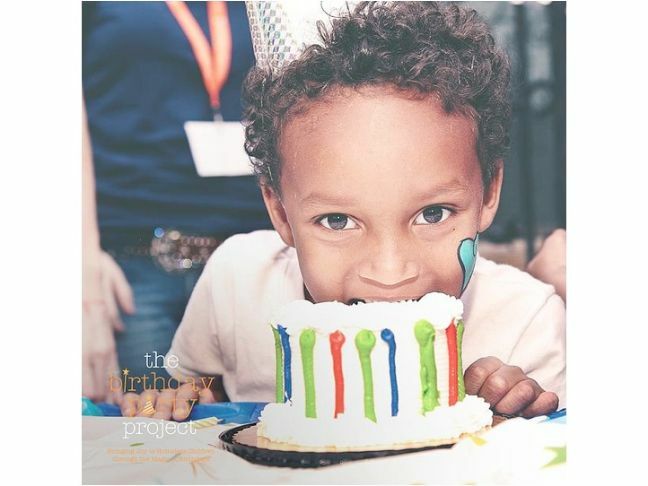 With the amazing support of its birthday enthusiasts (volunteers), The Birthday Party Project hosts monthly birthday parties at homeless and transitional living facilities. At the parties, the children enjoy activities and crafts, decorations, games, cupcakes, and party favors. A birthday gift and birthday badge is given to each child celebrating a birthday that month. The Confetti Foundation supplies birthday party kits to children who spend their birthdays in the hospital. Through the party kits, children of all ages are celebrated and honored on their special day. Stephanie Frazier Grimm developed The Confetti Foundation when her best friend’s baby was born eight weeks premature with many complications. Stephanie’s friend spent hours every day driving to the hospital NICU with her toddler and husband as her baby gradually grew stronger. During those long drives, Stephanie and her friend would talk about their families, the weather, their jobs, the good times they had in college, and anything else that served as a distraction. One conversation led to baby C’s hospital “buddy” who was going home and finally getting to have a birthday celebration. The Birthday Party Project photos courtesy of The Birthday Party Project. Confetti Foundation photos courtesy of Meghan Sepe Photography. How Do You Teach Your Kids Gratitude?